Norwegian’s U.S. based flight attendants have delivered letters to the Obama Administration urging the “swift approval” of the foreign air carrier permit application submitted by Norwegian’s affiliate, Norwegian Air International (NAI). More than 300 U.S. flight attendants work for Norwegian at their crew bases in New York City and Fort Lauderdale. Approval of the foreign carrier permit application has been pending for more than a year. NAI, a fully licensed European carrier, is seeking approval of a foreign carrier permit in order to substantially expand service between the United States and Europe. “With orders for hundreds of Boeing aircraft, approval of the application will support American jobs in the tourism, travel, aviation, and U.S. manufacturing industry. Approval will also support the Administration’s goal of bringing more foreign tourists to the U.S.,” stresses Norwegian’s U.S. based cabin crew, who are now taking time off their busy schedules to support their airline in Washington DC today. 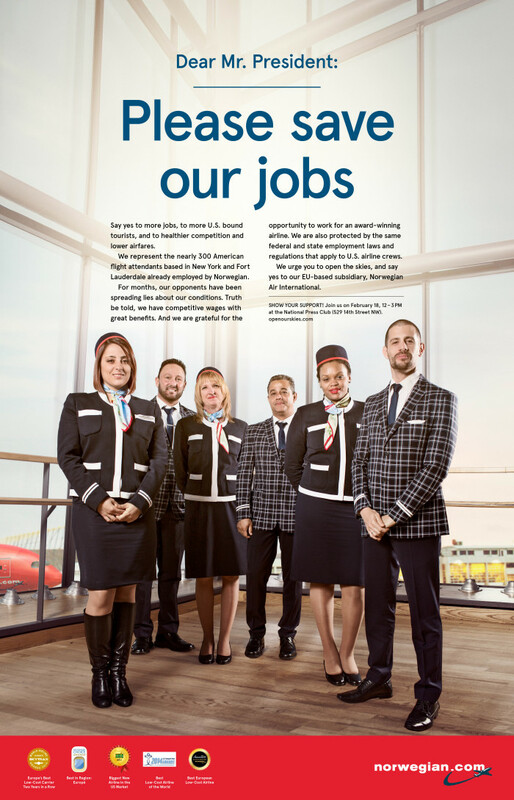 “Norwegian has made a strong commitment to the U.S. economy and given 300 American Flight Attendants jobs,” said Joseph Gabriel, Base Chief Cabin Crew at Norwegian’s Fort Lauderdale base. Gabriel flies on routes between the US and Europe, and is one of the many cabin crew who have repeatedly demanded that the application must be approved. “Norwegian is a future-oriented airline that is not only creating jobs within the airline, but also within the entire tourism industry by bringing several hundred thousand tourists to the U.S. every year. It’s about time that NAI is approved so that Norwegian can continue to offer the American traveller non-stop transatlantic destinations at lower and more competitive fares,” he says. Today, February 18, 50 flight attendants from Norwegian’s U.S. bases will unite on the steps of the U.S. Department of Transportation in Washington DC, to show their support and solidarity for swift approval of NAI’s foreign air carrier permit application, which has been pending at the Department of Transportation for over a year. The new routes Norwegian wants to open will provide more jobs for pilots, crew and local municipalities, while also providing more choices and lower fares for the U.S. traveller. The dedicated Norwegian U.S. crews know how important this is to both travellers and the airline industry, which is why they have taken the time from their schedules to come to Washington to voice their opinions.